Have you ever known anyone to complain about having too much storage space? Our Springs luxury apartment homes have generous storage, including walk-in closets. But we all seem to accumulate more than we throw out, so you can always use more room. We've put together a list of our favorite hacks for apartment storage. Which ones work for you? It's difficult to find a convenient place to store accessories. Just attach some inexpensive shower curtain rings to a hanger and use it to hold scarves, purses, belts and any other hard-to-organize items. Ice cube trays and egg cartons are perfect for storing jewelry and organizing paper clips, rubber bands and other items in a home office or junk drawer. 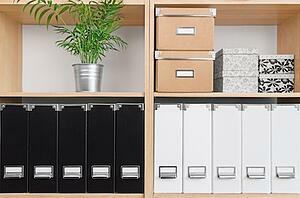 As a bonus, they're stackable so you can add storage without taking up more horizontal space. Shoe boxes are also good caddies for dresser drawers. They can easily accommodate items like underwear and socks, or you can use them to hold rolled-up t-shirts and tank tops. Give empty glass jars and cans new life as organizers for cotton balls, makeup brushes and other small toiletries. You might want to put attractive or unusual-looking containers on the vanity, but they work just as well inside a cabinet. Solve two challenges at once by rinsing out wet-wipe containers and using them to hold and dispense plastic shopping bags. Spice racks are great ways to store nail polish, essential oils or other small items. They make a nice decorative element also! You can often discover valuable storage space by thinking vertically. For instance, you can gain a lot of room by hanging baskets under shelves or cabinets. Speaking of vertical storage space, doors have vast amounts of unused real estate that can be used to accommodate hooks, pockets and a variety of storage solutions. Do you have a hobby that requires a lot of supplies? Assemble a simple pegboard box that provides storage inside and outside. It also makes a great gift-wrapping station that can hold those difficult-to-store rolls of paper. Tangled-up cords and chargers are an unfortunate by-product of today's technology. Simply attach binder clips to the edge of a table to keep them organized. Do you have a creative storage hack to add to our list? Share it with us in the comments!